You can transfer SMS from and iPhone device to your Samsung Galaxy S3 in just a single click, without jailbreaking or rooting the device. How is this possible you ask? Well, I say you should keep on reading this content to find out how. If you have an iPhone and an Android phone like the Galaxy S3, S4 or S5, chances are that you would want to backup all those important iPhone files such as SMS on your android phone as well. Good thing, we now have several iPhone SMS to Android Transfer tools available to get this thing done in an instant. One of these tools is the Backuptrans iPhone SMS to Android Transfer. 1. To transfer SMS from iPhone to Android phone. 2. Transfer SMS to Android from iTunes Backup. 3. Save SMS from an iPhone to local database on a computer. 4. Copy SMS from a computer 's local database to an Android device. 5. Export SMS from iPhone to document files such as csv, txt, doc or html. 6. Print out SMS messages in threading conversations from an iPhone device. Transferring of SMS from iPhone to Galaxy S3 using Backuptrans iPhone SMS to Android Transfer is instant and direct. All you have to do is to connect both your iPhone and Galaxy S3 to a computer, and follow the on-screen prompts to complete the entire SMS transfer in a few seconds. Users can choose to either transfer all SMS from an iPhone to an Androidphone or only transfer the SMS with select friends or contacts as you prefer. In addition, you can choose to transfer SMS into an Android device from iTunes backup, that is if you have once backed up you iPhone data with your iTunes library. 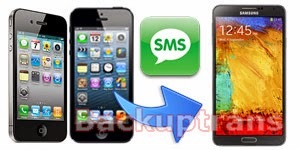 The latest update on Backuptrans iPhone SMS to Android Transfer supports iOS 8 beta, Android 4.4 Kitkat, iOS 7, iPhone 5S/5C, Android WiFi connection and iMessages backup, transfer, export and print. Requirements specifications for Windows computer to use during the transfer include Windows NT, 2000, XP, 2003, Vista, Windows 7 and Windows 8. A Mac Version is also available for Mac users.